This API is still experimental and under development. It isn’t available right off the bat in Chrome. From my experience some operating systems still don’t detect very well (my Linux machine can’t detect anything, my Windows machine only detects faces and my Apple machines detect face, eyes and mouth). 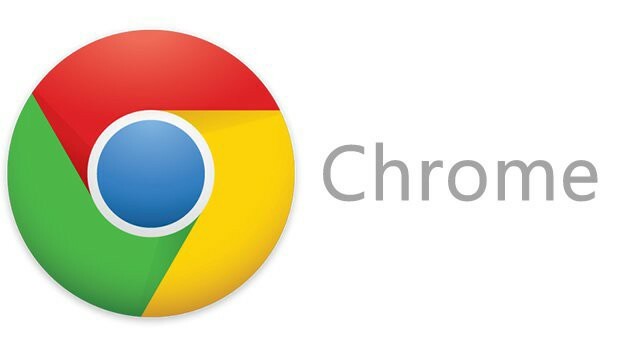 To put it available you must first enable Experimental Web Platform Features on your Chrome’s flags. Very simple to do. And enable the Experimental Web Platform features section. After enabling it you should see a Relaunch Now button on the bottom of the screen. 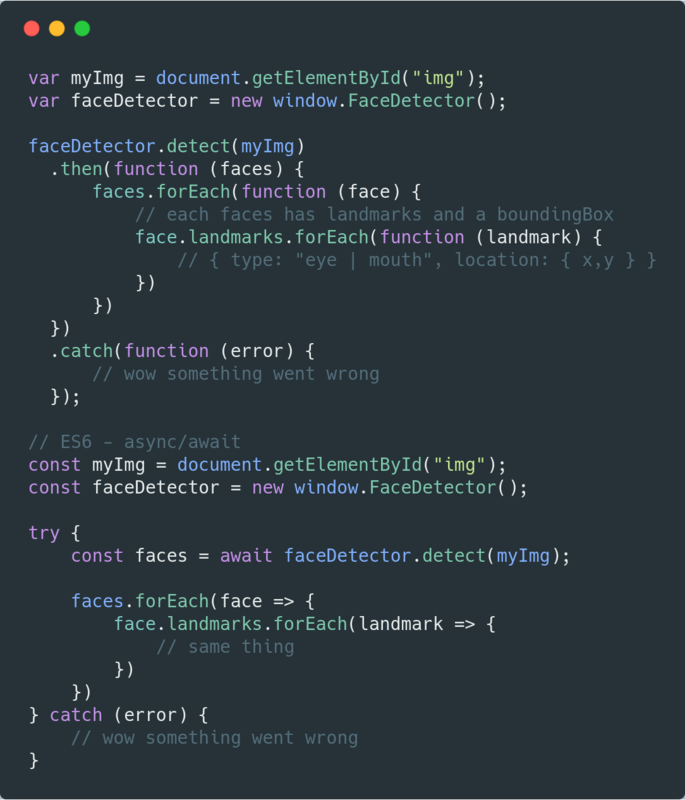 After relaunching you should be able to access the FaceDetector API from a console window for example. I never touched on something like this before and I thought it would make a great challenge to make some kind of snapchat / instagram filter. I first stumbled upon this API on Wes Bos’s twitter. After that I went on trying to find something about the API eventually finding the link below. 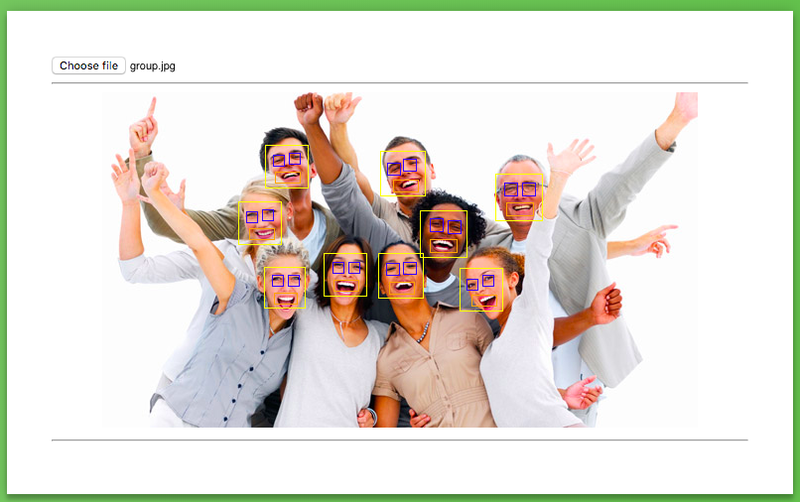 In it the author mentions some pretty cool use cases for FaceDetection. Pretty cool when you think about it right?! I recommend you read it. Pretty simple really, there is nothing really that complicated. I ended up building a prototype to see if I could get something like a snapchat filter with googly eyes. I actually got it to work and it’s available in CodeSandbox below. I also learned that, at least for now, this API is not really meant to be used in situations like video capture because, the more smooth I wanted it to get, the API would mostly crash when called on 30 or 60 fps. Mostly all of the project is done with sort of hacky code but I focused mainly on getting it to work than making it look good. I’ve observed different behaviours in several computers. My proxy configured work machine cannot call the FaceDetector service at all. Some older computers only detect the face but 0 landmarks (still don’t know why). On my personal work machine (Macbook Air) works fine and it can detect faces and landmarks such as eyes and mouths. In all apple machines I’ve tried it worked fine. If you want to stay updated on everything I write please feel free to Followme!